Winter Cyclamen have rounded heart-shaped leaves that emerge in autumn and are attractive well into spring. The flowers appear from late autumn to early spring. Ideal for patio pots tubs hanging baskets and borders. 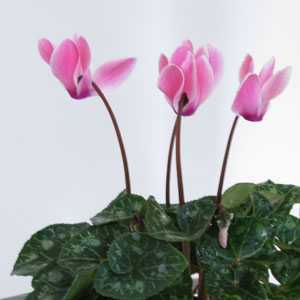 To Plant; - gently loosen plants from their trays by pushing them up from the base. Knock out plants from pots by giving a sharp tap to the bottom with the handle of your trowel. 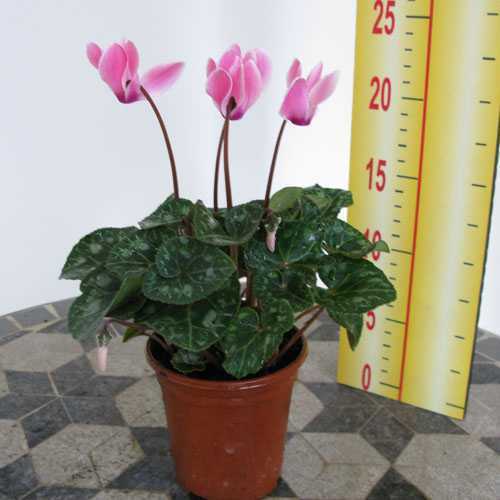 Remember, keep your hand securely over the top of the plant when doing this so you do not drop it on the ground! Handle plants by leaves or rootball. Use a compost that drains freely. When dead-heading, snap the stem from inside of the plant underneath the foliage to keep the plant neat & tidy and to encourage fresh growth.